The current media debate about the benefits (or lack of harm) of high fructose corn syrup (HFCS) in our diet misses the obvious. The average American increased their consumption of HFCS (mostly from sugar sweetened drinks and processed food) from zero to over 60 pounds per person per year. During that time period, obesity rates have more than tripled and diabetes incidence has increased more than seven fold. Not perhaps the only cause, but a fact that cannot be ignored. Doubt and confusion are the currency of deception, and they sow the seeds of complacency. These are used skillfully through massive print and television advertising campaigns by the Corn Refiners Association’s attempt to dispel the “myth” that HFCS is harmful and assert through the opinion of “medical and nutrition experts” that it is no different than cane sugar. It is a “natural” product that is a healthy part of our diet when used in moderation. Except for one problem. When used in moderation it is a major cause of heart disease, obesity, cancer, dementia, liver failure, tooth decay and more. Why is the corn industry spending millions on misinformation campaigns to convince consumers and health care professionals of the safety of their product? Could it be that the food industry comprises 17 percent of our economy? The goal of the corn industry is to call into question any claim of harm from consuming high fructose corn syrup, and to confuse and deflect by calling their product natural “corn sugar”. That’s like calling tobacco in cigarettes natural herbal medicine. Watch the slick ad where a caring father walks hand in hand with his four-year-old daughter through a big question mark carved in an idyllic cornfield. Physicians are also targeted directly. I received a 12-page color glossy monograph from the Corn Refiners Association reviewing the “science” that HFCS was safe and no different than cane sugar. I assume the other 700,000 physicians in America received the same propaganda at who knows what cost. In addition to this, I received a special “personal” letter from the Corn Refiner’s Association outlining every mention of the problems with HCFS in our diet – whether in print, blogs, books, radio or television. They warned me of the errors of my ways and put me on “notice”. For what I am not sure. To think they are tracking this (and me) that closely gives me an Orwellian chill. New websites like www.sweetsurprise.com and www.cornsugar.com help “set us straight” about HFCS with quotes from professors of nutrition and medicine and thought leaders from Harvard and other stellar institutions. But are these twisted sweet lies or a sweet surprise, as the Corn Refiners Association websites claim? Let’s examine the science and insert some common sense into the conversation. These facts may indeed come as a sweet surprise. The ads suggest getting your nutrition advice from your doctor (who, unfortunately, probably knows less about nutrition than most grandmothers). Having studied this for over a decade, and having read, interviewed or personally talked with most of the “medical and nutrition experts” used to bolster the claim that “corn sugar” and cane sugar are essentially the same, quite a different picture emerges and the role of HCFS in promoting obesity, disease and death across the globe becomes clear. Last week over lunch with Dr. Bruce Ames, one of the foremost nutritional scientists in the world and Dr. Jeffrey Bland, a nutritional biochemist, a student of Linus Pauling and I reviewed the existing science, and Dr. Ames shared shocking new evidence from his research center on how HFCS can trigger body-wide inflammation and obesity. Here are 5 reasons you should stay way from any product containing high fructose corn syrup and why it may kill you. Cane sugar and high fructose corn syrup are indeed both harmful when consumed in pharmacologic doses of 140 pounds per person per year. When one 20 ounce HFCS sweetened soda, sports drink or tea has 17 teaspoons of sugar (and the average teenager often consumes two drinks a day) we are conducting a largely uncontrolled experiment on the human species. Our hunter gather ancestors consumed the equivalent of 20 teaspoons per year, not per day. In this sense, I would agree with the corn industry that sugar is sugar. Quantity matters. But there are some important differences. High fructose corn syrup is an industrial food product and far from “natural” or a naturally occurring substance. It is extracted from corn stalks through a process so secret that Archer Daniels Midland and Carghill would not allow the investigative journalist, Michael Pollan to observe it for his book, The Omnivore’s Dilemma. The sugars are extracted through a chemical enzymatic process resulting in a chemically and biologically novel compound called HFCS. Some basic biochemistry will help you understand this. Regular cane sugar (sucrose) is made of two-sugar molecules bound tightly together – glucose and fructose in equal amounts. The enzymes in your digestive tract must break down the sucrose into glucose and fructose, which are then absorbed into the body. HFCS also consists of glucose and fructose, not in a 50-50 ratio, but a 55-45 fructose to glucose ratio in an unbound form. Fructose is sweeter than glucose. And HCFS is cheaper than sugar because of the government farm bill corn subsidies. Products with HFCS are sweeter and cheaper than products made with cane sugar. This allowed for the average soda size to balloon from 8 ounces to 20 ounces with little financial costs to manufacturers but great human costs of increased obesity, diabetes and chronic disease. Now back to biochemistry. Since there is there is no chemical bond between them, no digestion is required so they are more rapidly absorbed into your blood stream. Fructose goes right to the liver and triggers lipogenesis (the production of fats like triglycerides and cholesterol) this is why it is the major cause of liver damage in this country and causes a condition called “fatty liver” which affects 70 million people. The rapidly absorbed glucose triggers big spikes in insulin – our body’s major fat storage hormone. Both these features of HFCS lead to increased metabolic disturbances that drive increases in appetite, weight gain, diabetes, heart disease, cancer, dementia and more. But there was one more thing I learned during lunch with Dr. Bruce Ames. Research done by his group at the Children’s Hospital Oakland Research Institute found that free fructose from HFCS requires more energy to be absorbed by the gut and soaks up two phosphorous molecules from ATP (our body’s energy source). This depletes the energy fuel source or ATP in our gut required to maintain the integrity of our intestinal lining. Little “tight junctions” cement each intestinal cell together preventing food and bacteria from “leaking” across the intestinal membrane and triggering an immune reaction and body wide inflammation. High doses of free fructose have been proven to literally punch holes in the intestinal lining allowing nasty byproducts of toxic gut bacteria and partially digested food proteins to enter your blood stream and trigger the inflammation that we know is at the root of obesity, diabetes, cancer, heart disease, dementia and accelerated aging. Naturally occurring fructose in fruit is part of a complex of nutrients and fiber that doesn’t exhibit the same biological effects as the free high fructose doses found in “corn sugar”. The takeaway: Cane sugar and the industrially produced, euphemistically named “corn sugar” are not biochemically or physiologically the same. An FDA researcher asked corn producers to ship a barrel of high fructose corn syrup in order to test for contaminants. Her repeated requests were refused until she claimed she represented a newly created soft drink company. She was then promptly shipped a big vat of HFCS that was used as part of the study that showed that HFCS often contains toxic levels of mercury because of chlor-alkali products used in its manufacturing. (i) Poisoned sugar is certainly not “natural”. When HFCS is run through a chemical analyzer or a chromatograph, strange chemical peaks show up that are not glucose or fructose. What are they? Who knows? This certainly calls into question the purity of this processed form of super sugar. The exact nature, effects and toxicity of these funny compounds have not been fully explained, but shouldn’t we be protected from the presence of untested chemical compounds in our food supply, especially when the contaminated food product comprises up to 15-20 percent of the average American’s daily calorie intake? 4. Independent medical and nutrition experts DO NOT support the use of HCFS in our diet, despite the assertions of the corn industry. He states that HFCS is absorbed more rapidly than regular sugar, and that it doesn’t stimulate insulin or leptin production. This prevents you from triggering the body’s signals for being full and may lead to overconsumption of total calories. True pharmacologic doses of any kind of sugar are harmful, but the biochemistry of different kinds of sugar and their respective effects on absorption, appetite and metabolism are different, and Dr. Popkin knows that. David S. Ludwig, M.D., Ph.D., Associate Professor of Pediatrics, Harvard Medical School, and a personal friend has published extensively on the dangers and the obesogenic properties of sugar-sweetened beverages. He was quoted as saying that“high fructose corn syrup is one of the most misunderstood products in the food industry.” When I asked him why he supported the corn industry, he told me he didn’t and that his comments were taken totally out of context. Misrepresenting science is one thing, misrepresenting scientists who have been at the forefront of the fight against obesity and high fructose sugar sweetened beverages is quite another. 5. HCFS is almost always a marker of poor-quality, nutrient-poor disease creating industrial food products or “food-like substances”. The last reason to avoid products that contain HFCS is that they are a marker for poor-quality, nutritionally depleted, processed industrial food full of empty calories and artificial ingredients. 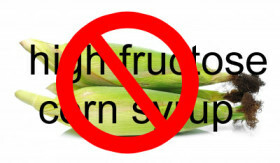 If you find “high fructose corn syrup” on the label you can be sure it is not a whole, real, fresh food full of fiber, vitamins, minerals, phytonutrients and antioxidants. Stay away if you want to stay healthy. We still must reduce our overall consumption of sugar, but with this one simple dietary change you can radically reduce your health risks and improve your health. While debate may rage about the biochemistry and physiology of cane sugar vs. corn sugar, this is in fact beside the point (despite the finer points of my scientific analysis above). The conversation has been diverted to a simple assertion that cane sugar and corn sugar are not different. The real issues are only two. We are consuming HFCS and sugar in pharmacologic quantities never before experienced in human history — 140 pounds a year vs. 20 teaspoons a year 10,000 years ago. High fructose corn syrup is always found in very poor quality foods that are nutritionally vacuous and filled with all sorts of other disease promoting compounds, fats, salt, chemicals and even mercury. These critical ideas should be the heart of the national conversation, not the meaningless confusing ads and statements by the corn industry in the media and online that attempt to assure the public that the biochemistry of real sugar and industrially produced sugar from corn are the same. Do you think there is an association between the introduction of HFCS in our diet and the obesity epidemic? What reason do you think the Corn Refiners Association has for running such ads and publishing websites like those listed in this article? What do you think of the science presented here and the general effects of HFCS on the American diet? Please leave your thoughts by adding a comment below. (i) Dufault, R., LeBlanc, B., Schnoll, R. et al. 2009. Mercury from chlor-alkali plants: Measured concentrations in food product sugar. Environ Health. 26(8):2. (ii) Bray, G.A., Nielsen, S.J., and B.M. Popkin. 2004. Consumption of high-fructose corn syrup in beverages may play a role in the epidemic of obesity. Am J Clin Nutr.79(4):537-43. Review.